Many forms of income are easy to categorize as California source — rents from or sales of California real estate, income from operating a California business, wages for work performed in-state. When LeBron James plays the Clippers at Staples Center, he’s plying his trade in California and therefore pays California income taxes on the wages earned that night on the court. But others are more difficult to source. Running an out-of-state business while on vacation in California falls into a gray area. There is no case law or regulations on “working vacations” or “vacationing work.” The law was created before the internet, ecommerce and the connected economy. People used to go on vacation and do little else but enjoy themselves, except perhaps the occasional phone call to the office. 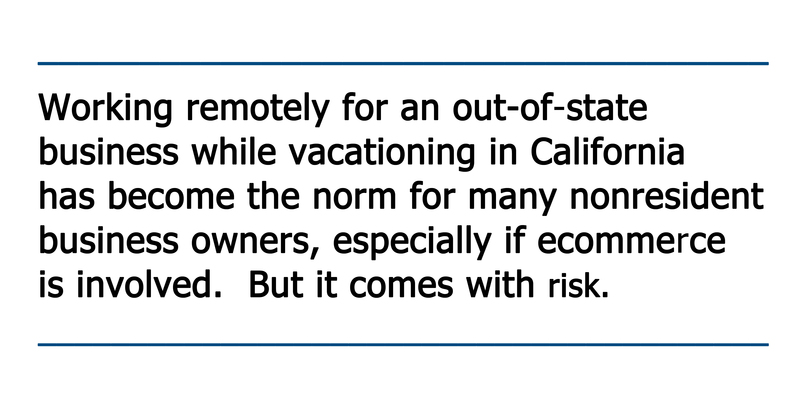 The case law assumes when a person is on vacation in California, they aren’t working, by definition. But this notion is archaic. 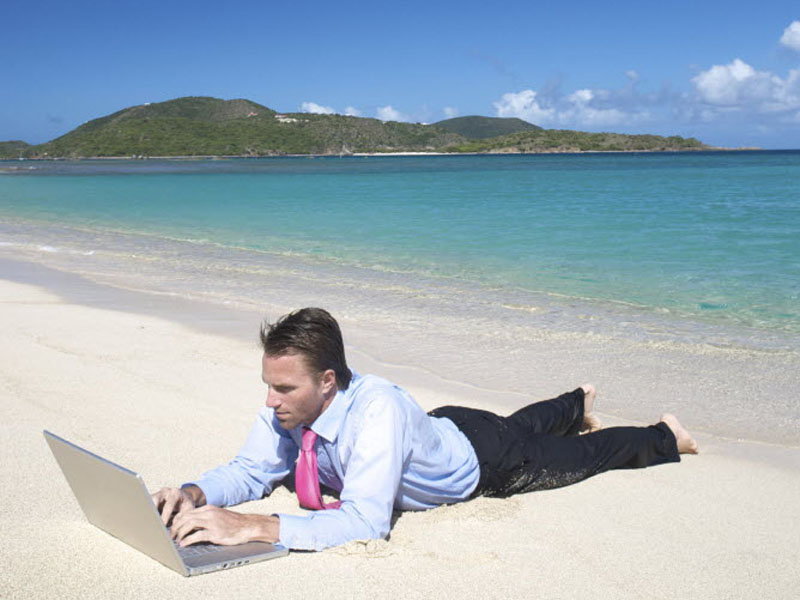 Most nonresident business owners can run their business while on vacation and in fact often can’t avoid doing so. If we are talking about a four-month vacation stay, the income tax risk can add up. California residency regulations treat work carried on in-state as California source. It doesn’t matter if the work is performed for a non-California business. So it’s fair to say that if the FTB audited a nonresident and found he was working remotely for an out-of-state enterprise while on vacation, the FTB would assess a tax. There is a limited exception that might save the workaholic vacationer: if a nonresident’s gross income is below a certain threshold, there is no reporting requirement for California source income. 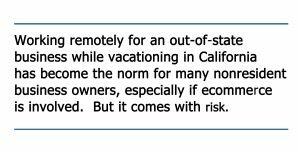 But the threshold is so low (basically 16,000 for a single person, and $35,000 for married couples), that it doesn’t apply to most business people who have the luxury of vacationing in the Golden State for any length of time. There are ways around this problem, but they take careful planning and can have significant downsides. California can’t tax a nonresident’s work in California if it isn’t compensated. Most business owners or top management control their compensation packages. If the agreement is, the nonresident can vacation in California all he wants, but any work there will not be compensated, then there is no income for California to tax. Of course, this results in a different problem — it’s always better to make more money and pay taxes on in, even at California’s high rates, than to make less money. But if the company can make up for that with a larger share of profits (not taxable by California because there is no business situs here), some other nontaxable fringe benefits, or higher pay for on-site work, then it may be worth it to reduce the risk of an unfavorable audit. But this may in turn raise other issues. Specifically, the IRS won’t allow business owners to claim their compensation is pure profit; rather it deems a reasonable portion of their compensation as payment for work (and subject to higher rates, FICA, etc. ), assuming they aren’t passive investors. So, any plan to limit taxable California income for remote work must take into consideration federal rules. To summarize: working remotely for an out-of-state business while vacationing in California has become the norm for many nonresident business owners, especially if ecommerce is involved. But it comes with risk. If you are audited, the compensation related to that work may be taxable by California as California source. At the entity level, there may be work-arounds, and this may be important if the vacation is an extended stay, potentially exposing large amounts of income to California source taxation. But any such arrangement requires significant tax planning at both the state and federal level. Or you could just take an old-fashioned vacation, and not do any work.